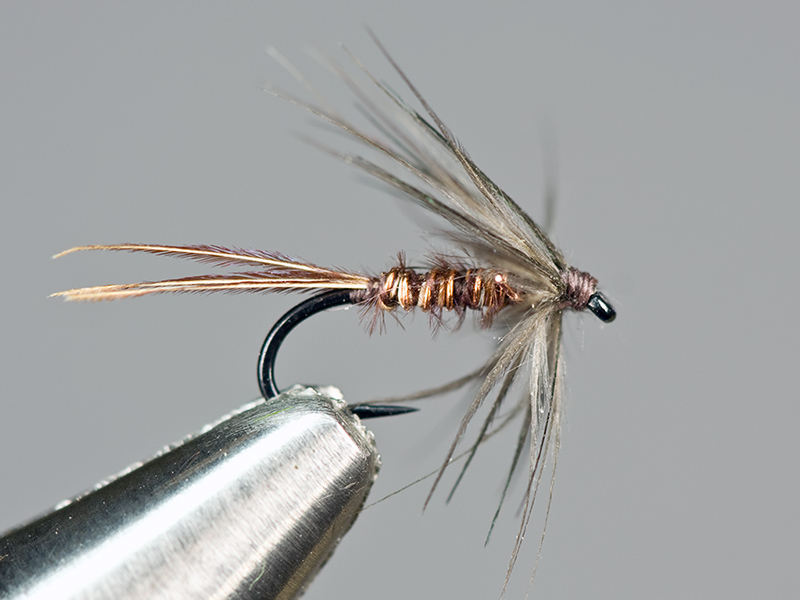 The fly I tie on second when fishing a BWO hatch is a simplified pheasant tail nymph. Just thread, copper wire, 3 pheasant tail fibers and a starling breast feather. You could easily make it simpler by skipping the wire and feather, but I think they both add to the effectiveness and durability, so I am willing to take the additional minute to tie them in. In this fly, after tying in the tail and wire rib, I bring my thread to the eye and tie in the hackle. Then I twist the pheasant tail and wire together to make the body. It seems easier to me, but of course there is more than one way to tie a fly. As with my other BWO emergers, I use this fly as a dropper off a parachute Adams. Usually about 18 inches. Long enough to get a good drift but short enough to keep it close to the indicator. I don’t tie this fly too often because in twenty to thirty minutes you can tie up enough for the season! But be sure to keep a few in your flybox. You never know when you will need them and they may save the day for you sometime.